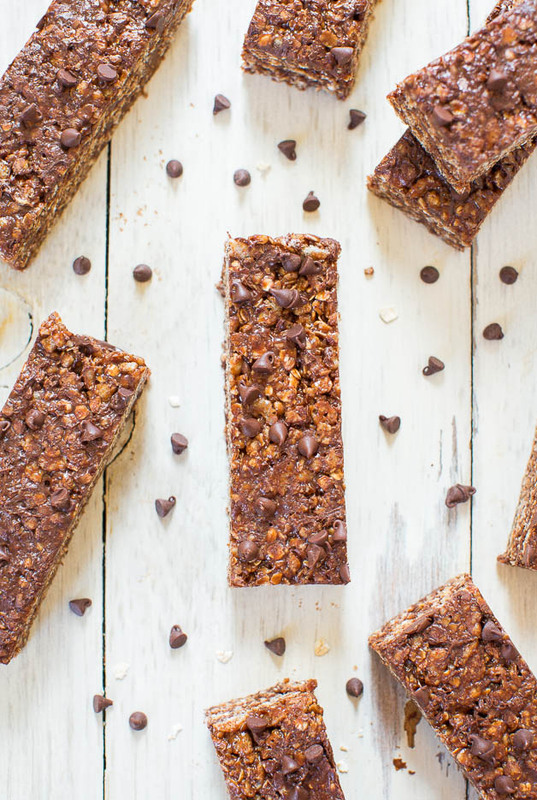 Move over Quaker Soft and Chewy Granola Bars. 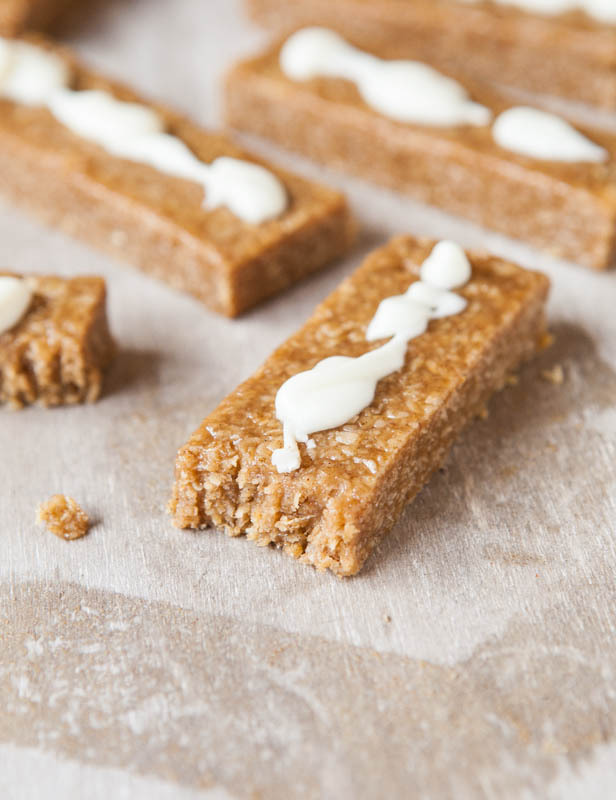 You can make these soft, chewy, vegan, gluten-free, and healthier DIY bars in 10 minutes. 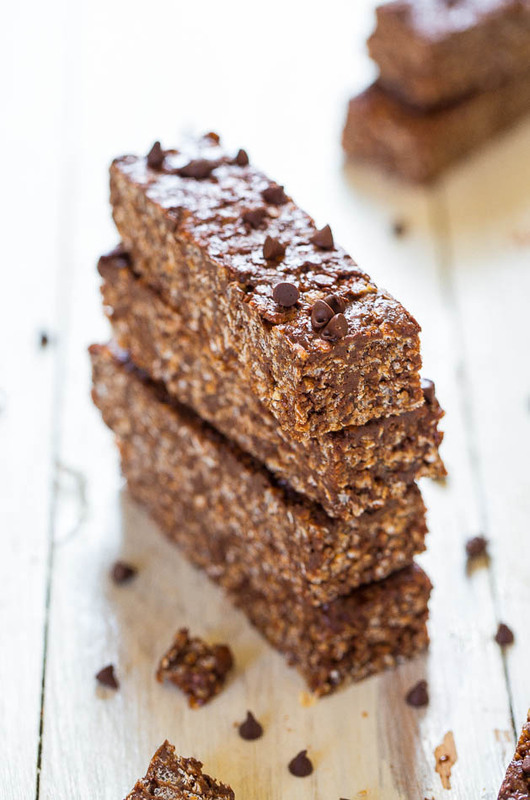 The recipe is adapted from my 2012 recipe for Peanut Butter Chocolate Chip Granola Bars (no-bake, vegan, GF) and I included a very similar recipe in my first cookbook. 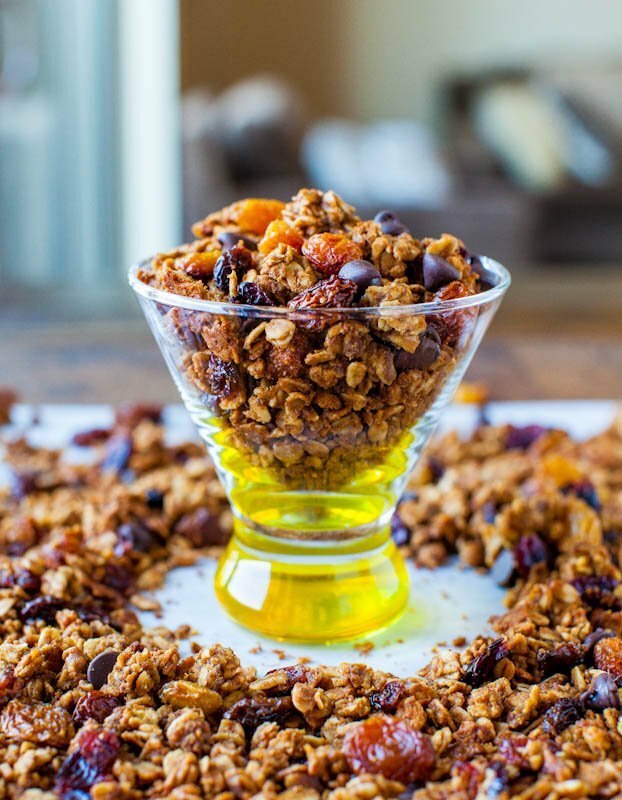 Readers have said they’re the best granola bars they’ve ever had, their kids love them, and they’re saving so much money making their granola bars at home. It would have been too easy to just leave the recipe alone. That’s not what food bloggers do. It’s mandatory to keep tinkering. So I made a chocolate version. Double chocolate. There’s both cocoa powder and mini chocolate chips, and while the chocolate flavor is present, it doesn’t overwhelm the peanut butter flavor. You get a pop of chocolate and peanut butter in every bite, and that’s a beautiful thing. 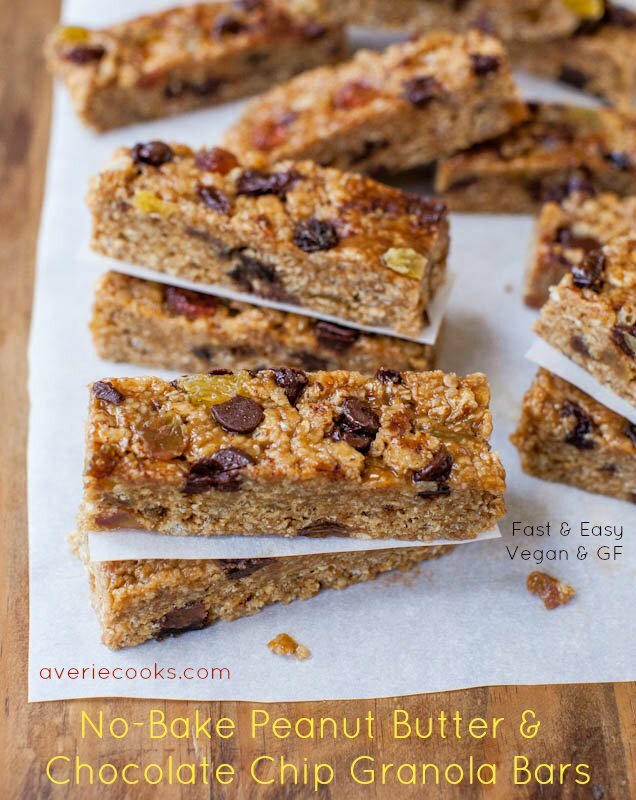 The bars are naturally vegan and gluten-free. Always read labels to select certified brands and the exact ingredients that are right for your dietary needs. The bulk, heft, and bigtime chewy-factor comes from quick cook oats. Quick cook oats are just whole-rolled oats that have been cut smaller in the manufacturing process to cook quicker. If you typically buy whole-rolled oats, pulse them in your food processor or blender for about 5 seconds and you’ve got quick cook. It’s important to use quick cook because they behave more like flour, binding together the wet ingredients. Whole-rolled oats are bigger, coarser, and won’t act as a proper binder and the bars won’t hold together. The special ingredient that gives the bars an extremely authentic mouthfeel and texture is crispy rice cereal. As you’re stirring it in, it magically seems to disappear into the very thick mixture, but does so much when you bite down for lightness and subtle crunch. The batch makes 1 dozen bars, very similar in size to the Quaker version. I wrap them individually in plasticwrap, keep a gallon-sized Ziplock filled with them, and then just toss the bars into school lunches, my purse, or my car. They’re not too messy which is nice, too. The bars can be customized with the add-ins you prefer, from dried fruit to nuts, making them very versatile. 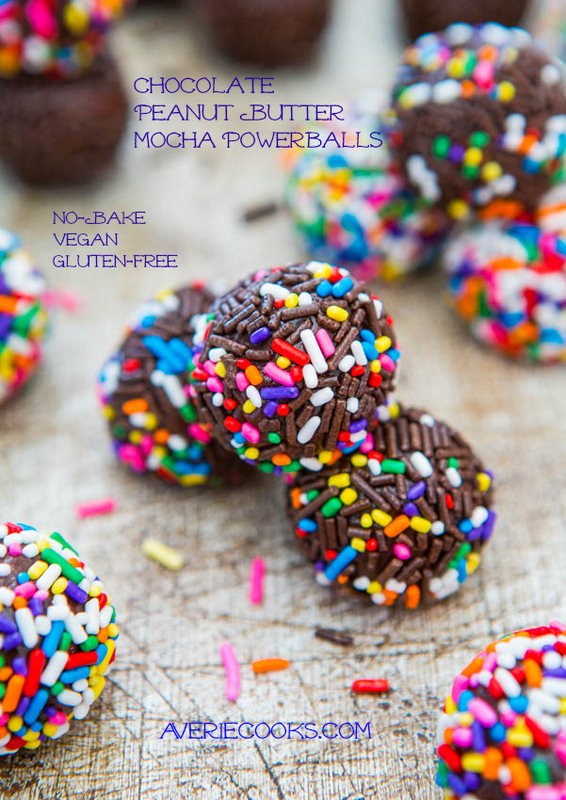 They taste like a candy bar, but much healthier than eating candy bars or chocolate peanut butter cookies when chocolate + PB cravings strike. They’re my new best friend. 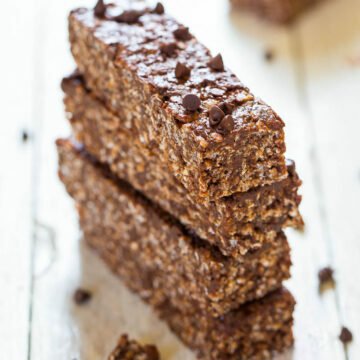 Move over Quaker Soft and Chewy Granola Bars and make these soft, chewy, vegan, gluten-free, and healthier DIY version in 10 minutes. 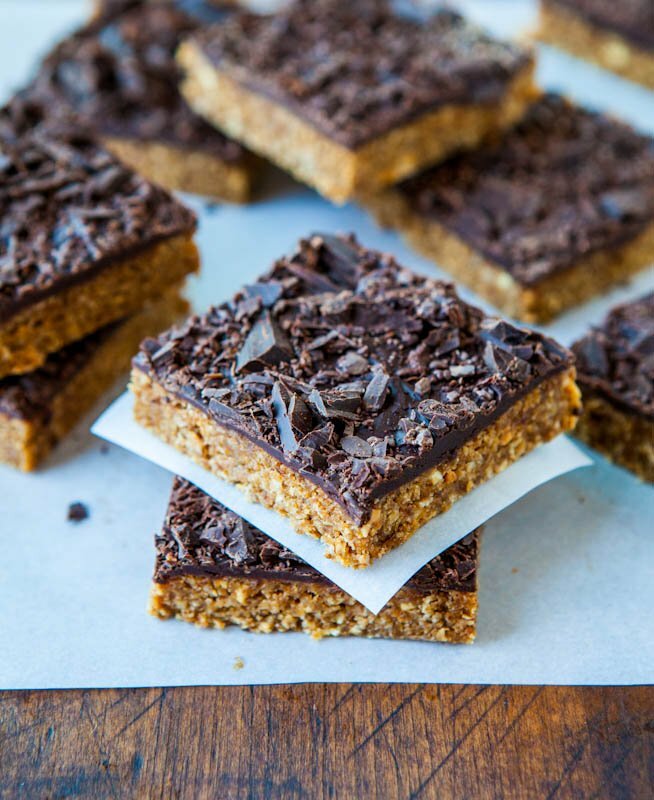 They’re soft, very chewy, and taste like a candy bar, but much healthier than candy bars when chocolate + PB cravings strike. They’re naturally vegan and gluten-free; always read labels to select certified brands and exact ingredients that are right for your needs. It’s important to use quick cook because they behave more like flour, binding together the wet ingredients so the bars hold together. 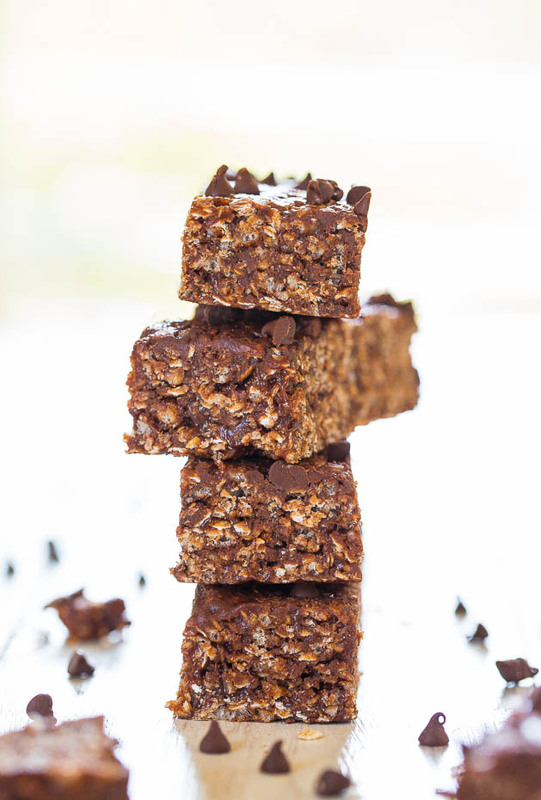 Crispy rice cereal gives the bars an authentic mouthfeel and texture. I wrap the bars individually in plasticwrap, keep a Ziplock filled with them, and toss the bars into school lunches, my purse, or car. They’re shelf-stable for weeks but they won’t last that long. Line an 8×8-inch pan with aluminum foil leaving overhang, spray with cooking spray; set aside. In a large, microwave-safe bowl combine corn syrup, peanut butter, brown sugar, and heat on high power for 1 minute; stir to combine. Return bowl to micro and heat for 1 more minute on high power, and stir to combine. Add vanilla, cocoa, optional salt, and whisk to combine. Add oats and stir to combine. Add 1 cup rice cereal and gently stir to combine so cereal doesn’t become too crushed. Slowly add the second cup of cereal, stirring while adding to incorporate. Mixture will be very thick, which is good so bars hold together after they’re set up. However, if your mixture seems extremely thick or dry, and doesn’t quite need the entire second cup or cereal, refrain from adding it all. Add 3/4 cup chocolate chips and stir to combine. The mixture is warm and chips will likely begin to melt, which is okay but the less stirring, the less melting. Reserve remaining 1/4 cup chips. Turn mixture out into prepared pan and pack it down firmly with a spatula or hands. Evenly sprinkle with the remaining 1/4 cup chocolate chips and very lightly tap them down with a spatula. Cover pan with a sheet of foil (to prevent fridge/freezer smells) and place pan in the fridge for at least 2-3 hours or in the freezer for at least 1 hour, or until bars have set up. Using foil overhang, remove bars from pan, place on cutting board, and slice. Mine are sliced 4-inches long by 1/2-inch wide, similar in size and shape to Quaker Chewy Granola Bars. Wrap bars individually in plasticwarp. Bars will keep wrapped in plasticwrap inside a large ziplock at room temperature for up to 1 month, in the fridge for up to 2 months, or in the freezer for up to 6 months. I am waiting for these to chill right now and cannot wait to taste one! 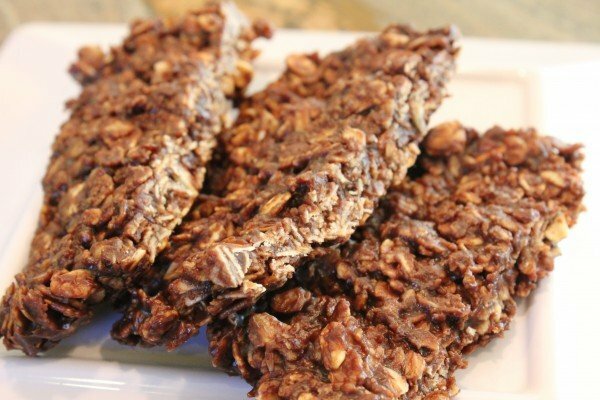 The recipe reminds me a bit of my favorite no-bake cookies–but of course, these have much less sugar and no butter! Hurrah! Not sure, I don’t count, but a pure guess is maybe 175-200 each, that’s a TOTAL GUESS though. Thanks for sharing and I totally agree! I made these yesterday, and they’re absolutely delicious! Easy to make, too. Thanks for the great recipe! Glad they worked out great for you! These are absolutely amazing! I’m about to make my third batch. They go so quickly. Everyone says that they are better than anything you could buy in the store. I’m in love! I assume I can do this on the stove top instead of the microwave – issue is to heat it up? Cannot wait to try this! Yes you can although I use the micro for speed and ease and haven’t done it on the stovetop so cannot quote exact times/temps. Thank you! Am trying to avoid microwave use so I will give it a whirl and let you know! sparks people have a calorie calculator. As written – these are pretty high in calories- over 300 per bar. We don’t count calories here, typically, but do watch sugar so I calculated the recipe info for that reason – about 30 grams per bar as written. I’m going to try the recipe with decreased sugars and add a touch of salt to enhance the flavor. Cut into 16 bars too – perfect size for my young kids. Thanks for the recipe. Hi Averie- These look yum but you may want to clarify a couple things in order to ensure a gluten free status. Quaker Oats aren’t gluten free, Bob’s Red Mill or other certified gluten free oats would be fine…while oats do not contain gluten they get cross contaminated while growing sometimes by wheat in the field or during harvesting. Also I would not only gluten free Rice Krispies, while it is linked to those it doesn’t state that specifically and regular rice krispies contain malt (not gf). Just passing these notes a long. Thank you! My 6-year-old and I made these this afternoon. They are absolutely amazing! We made them over the stovetop and it was very easy. Definitely making them again. Thanks for the recipe!! Glad you and your 6 y.o. are cooking together! How sweet! 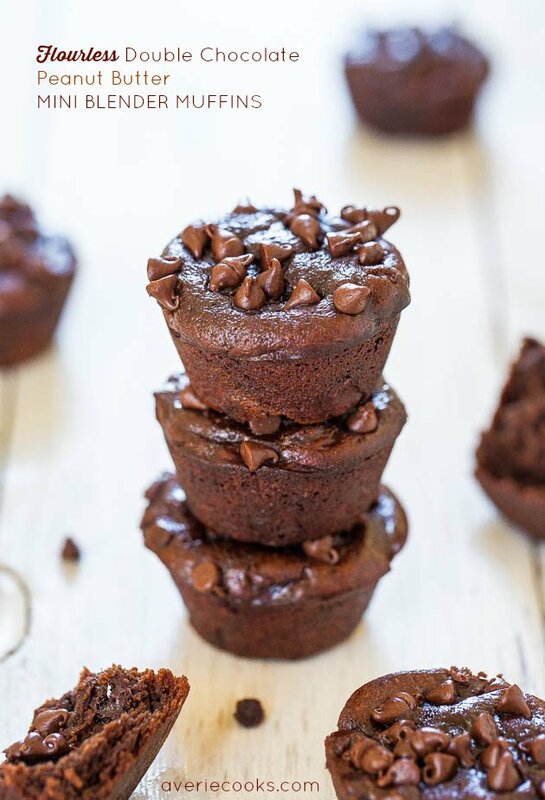 And glad these are a hit and you’ll make them again! I have old-fashioned oats – it that considered quick-cooked or whole-rolled? Once you answer-I will know how to proceed. I can’t wait to try this recipe since it has my name all over it. It looks so good!!!! And the chocolate…hmmm… Great recipe!! Can I skip the sugar? I don’t eat at all except coconut sugar (rarely)!! What do you suggest? I really haven’t experimented without the sugar but I think they would taste quite bitter and not enjoyable if you left it out due to the cocoa powder. Hi! I love this recipe. I have already done two batches and they are simply delicious. I have a question, do you know how many calories does the bars have? I don’t know the calories on it, sorry! Thanks for trying it twice already! I had never made anything with uncooked oats before. So when I first had a bite I quickly got worried and wondered if it was safe to eat. I googled it and it seems okay. I mean you seem to be pretty healthy and you make quite a few granolas with unbaked oats. (For that matter I love nature valley stuff but I have no idea what their cooking process is). But bottom line is that these are nice! And they are super filling. I can def. keep them handy. Have a great week. Hope you do something sweet for V-day. If you make your hubby/daughter something sweet can you post a pic of it on your twitter please? Is it possible to use all bran flakes instead of rice krispies? Probably but haven’t personally tried so can’t say for absolute sure. These are amazing!! Made them today & its hard to believe they’re granola bars. 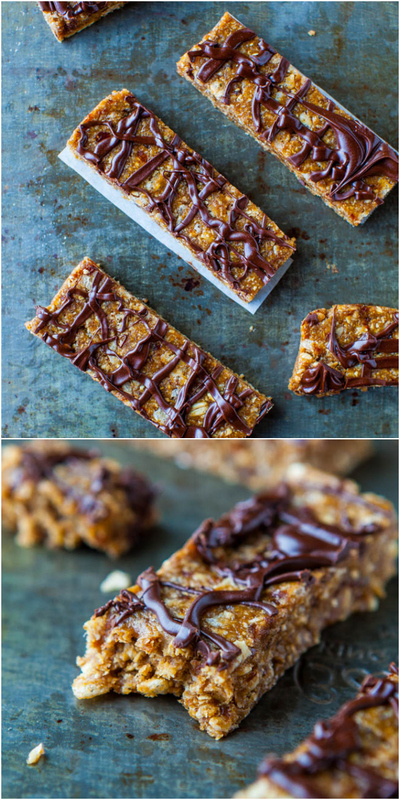 The perfect blend of candy bar & granola bar. Definitely a keeper recipe, thank you!! 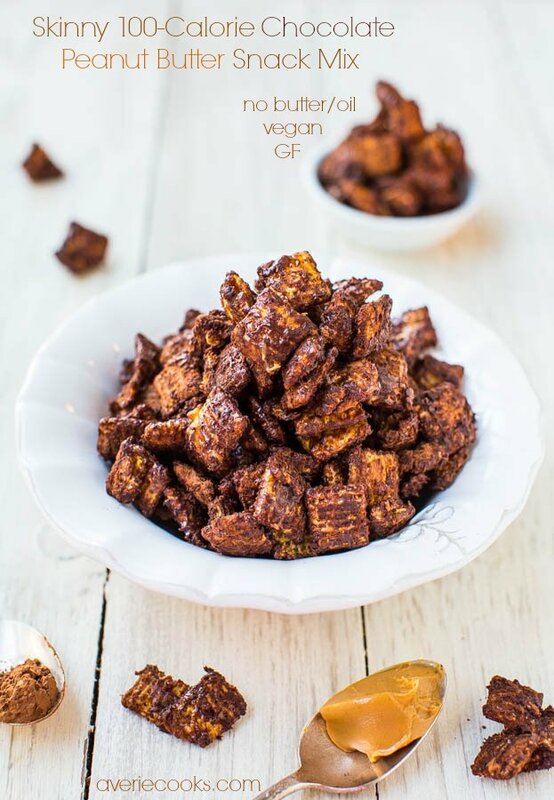 Came across this recipe and knew it would be amazing. I was drawn in and really impressed with the short length of time and no cooking involved aspects of the recipe. Made a couple customizations: I used honey instead of corn syrup (healthier option) and I used a combination of chocolate and peanut butter chips. Also, I do not own a microwave so I did this recipe in a saucepan on the stovetop. My fiance LOVES them! He’s a huge fan of anything with peanut butter, and since he’s 6’5″, he requires food frequently. This is his new favourite snack! Feedback for this recipe: it definitely took longer than 10 min… It took 10 minutes for me to get my ingredients out and measured, took about 10 minutes to combine the wet ingredients and oatmeal, plus another 5-10 min to add the crispy rice cereal and chocolate & pb chips. I put the bars in the freezer to set for 1 hour as the recipe indicated, but I think they probably only needed 20 minutes because I had to wait for them to thaw out before I sliced them. All in all, from start to finish, this recipe took me about 1.5-2 hours. Nonetheless, the end results are amazing and the bar look just like the pictures. I made these yesterday and they are amazing! I’m not really a fan of peanut butter so I used double the amount of cocoa powder, which I actually switched for chocolate protein powder and then only half of the rice crispies. I also added raisins, SO GOOD!! Thanks for trying the recipe and glad it came out great for you given the swaps and substitutions you made! Do you have a nutrition facts for these? I love peanut butter and chocolate combinations. This is a dangerous bar for me to have in the fridge – I keep going back for more. I cut them into small squares (about 3 cm) to try and get them to last longer but I may as well have cut them as you have because I tend to have at least two. My hubbie isn’t a peanut butter fan but he quite likes these. I’d prefer a stronger peanut butter flavour (peanut butter chips would help but we can’t get these in NZ and I haven’t yet attempted to make them myself). I also swapped out the light corn syrup for half brown rice syrup and half honey as I don’t have corn syrup. Very delicious. I’ll be making this again and again. Thanks for trying the recipe and I’m glad it came out great for you! Glad you’ll make again and again! Golden syrup is corn syrup in NZ – though it is dark in colour. However, it is very difficult to find light corn syrup where I live. Can I manage with glucose? Other substitutes? I haven’t tried any other ingredients other than what I wrote so not sure if it will work or not. I tried this for the first time yesterday and they taste amazing. Is it normal that the mixture is super thick already after adding in the first cup of oats? It got so thick and hard to combine after 2 cups of oats so I only managed to add 1 cup of rice krispies. Sounds like the type of oats you used was probably finer/denser than mine. So no, not normal, but you did the right thing to only add 1 c RK’s. I use Quaker brand whole-rolled oats. In the future you may want to either try that brand or scale back on the brand you use by a little bit.